March 14th, or 3/14, is Pi Day! That means today is a day to celebrate everyone’s favorite irrational number. What better way to pay homage than with pie? Here are some mathematically delicious options to try this year. YouTube star Rosanna Pansino runs a channel dedicated to nerdy baked goods, so it’s no surprise that she would have a great Pi Day recipe up her sleeve. Check out her Chocolate Oreo Mouse Pi Pie. She uses a stencil to make sure her Pi symbol is as clean as possible. YouTuber Heart of Tarts also tried her hand with a Pi-symbol-emblazoned pie, but used a well-cut apple. The baker also included some apple mathematical signs around it for added flair. Instagram user muppetwedding created not one pie, but a whole slew of miniature pies. There were 36 pies in all (pecan is pictured above). Instructables user aperiodictable took a different approach for her clever pi pie. She filled the crust with numbers that she created by pressing cheap cookie cutters into apples. The crust is also covered in little numbers arranged in the order of pi. 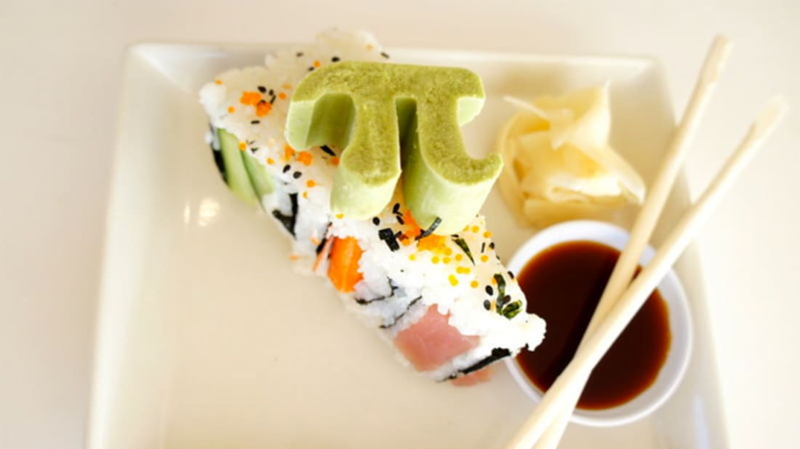 Instructables user lmnopeas reinvented what a pie could be by incorporating sushi. She used a mold to create wasabi pi symbols to sit on top of each slice. This kitschy pie is actually shaped like the pi symbol. Instructables user Legreck made the mold using aluminum foil. This delicious tome was made by Flickr user Jhayne. The book shaped pie has the first 24 digits carved into the cover, showing the apple filling inside. Virginia’s Pomodoro Pizza Pasta celebrated a past Pi Day with a special pizza pie. The pepperonis are arranged to create the shape of the pi symbol. This 35 digit pie shows pi’s numbers with colorful frosting. Flickr user Robert Couse-Baker says the pie was actually made on March 15, but it’s never too late to celebrate Pi Day by eating a delicious pie. Even Pillsbury wants a slice of the action. Their pie has the symbol cut out of the middle, showing off its mixed berry inside. There’s also a line of digits circling the outer crust.